Studies show that having a healthy smile can make you and those around you happier, but did you know it can also keep you healthier? Good oral health is highly regarded as an important indicator of overall health. While dentists are checking your teeth for evidence of good hygiene via proper brushing and flossing techniques, they are actually looking at more than just your teeth. During regular visits dentists check the teeth, soft tissues of the mouth, head and neck for clues about your overall state of health. A proper head and neck check should take less than five minutes and will include surveying the area under the jaw and the sides of the neck for swollen lymph nodes or asymmetry, and the insides of the lips and cheeks as well as the tongue, roof and floor of the mouth for lesions. Sometimes subtle deviations in these areas can lead to the early diagnosis of a condition before you or your physician have even detected it. While often more testing is required, dentists see patients hopefully twice a year for regular dental cleanings and can note seemingly small abnormalities and changes that may lead to a diagnosis of one of the following diseases. Oral Cancer: Although oral cancer is the sixth most common cancer in America, regular dental visits can aid in early detection which yields higher survival rates. Visual symptoms associated with oral cancer are primarily red and white lesions found on the tongue and in the mouth. Dentists should provide a routine oral cancer screening during regular appointments. Diabetes: While receding and bleeding gums can be simply a product of bad hygiene, those symptoms and others combined with personal risk factors could be a warning sign for diabetes. After closely examining the patient’s mouth and taking a thorough medical history, if the dentist’s educated guess is diabetes they will refer the patient to their regular doctor for testing. For patients who already have a diabetes diagnosis, their summative oral health can give clues about their successful, or not, management of the disease. Crohn’s disease: Studies show that up to twenty percent of patients diagnosed with inflammatory bowel disorder can develop lesions in the mouth before the onset of more typical symptoms of cramps and diarrhea. If the dentist sees fairly large linear ulcers on the inside of a patient’s lips and cheeks, they will most likely take a comprehensive look at their medical history. If no reasoning is readily apparent for the ulcers, the dentist will most likely refer the patient to their regular doctor for follow up. Gastrointestinal Reflux Disease (GERD): Stomach acid linked with this condition can wear away tooth enamel and cause lesions in the back of the mouth. Patients experiencing these symptoms are referred to their regular physician for testing and possibly a prescription for a medicine that will help reduce damaging acid production. Different Forms of Anemia: This condition is often characterized by the lack of red blood cells circulating in the body and may be related to iron deficiency. It can cause people to be extremely tired or lethargic. Dentists may be able to see further evidence of anemia if the lining of a patient’s mouth is very light and the tongue looks smooth rather than bumpy. A simple blood test by a licensed physician should yield definitive results. Different vitamin deficiencies may be noted in a form of shiny, red, smooth, raw tongue, or angular cheilitis (chronic irritation of the corners of the mouth). In some severe cases of vitamin C deficiency, tooth mobility, ulcerations, and increased severity of periodontal infections and bone loss may occur. While less scientific proof exists on the connection between conditions like heart disease, osteoporosis, and rheumatoid arthritis, careful examination of the gums, jaws, and teeth resulting in some unexplained abnormalities may prompt the dentist to encourage a patient to follow up with their regular doctor. If a patient is seeing their dentist every six months, the dentist could plausibly end up seeing them more than their regular physician will. Because of this frequency, dentists are often on the front line when it comes to noticing subtle abnormalities sometimes missed by the patient. Not only can they identify these abnormalities, but they are typically able to compare those trouble spots with x-rays and notes from the patient’s most recent visit. 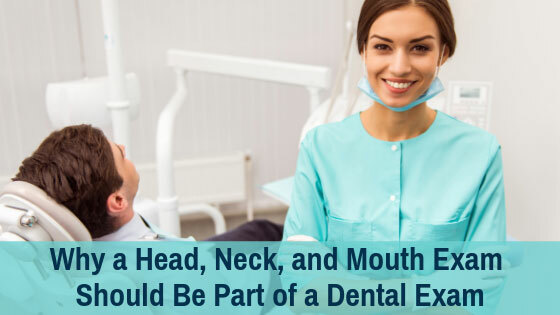 For someone diagnosed with oral cancer whose journey began because of a dentist’s concerns, the head, neck, and mouth exam may very well turn out to be lifesaving because of an early diagnosis. The same could be said for patients referred to a doctor because of their dentist’s suspicions of possible diabetes. The next time you go for a regular checkup at the dentist, take note of their head, neck, and mouth exam and don’t be afraid to ask questions or bring up any concerns. Being proactive with your dental health could very well save your teeth, and your life.